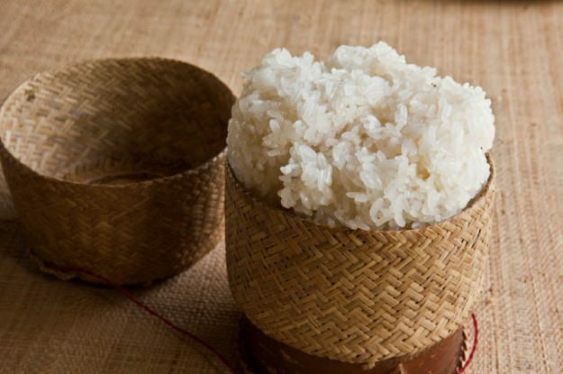 The foundation of all Lao meals, most Laos prefer sticky rice to regular steamed white rice. Sticky rice is served in a small woven basket. The best way to eat is to roll the sticky rice by hand into small balls, dipped into food and sauces like jeow, a dry, non-oily chili paste with a bit of buffalo skin mixed in, and eat with the fingers. Variations include sticky brown rice and Khao Lam, glutinous rice cooked inside a tube of bamboo, infusing it with an earthy, woody flavor. 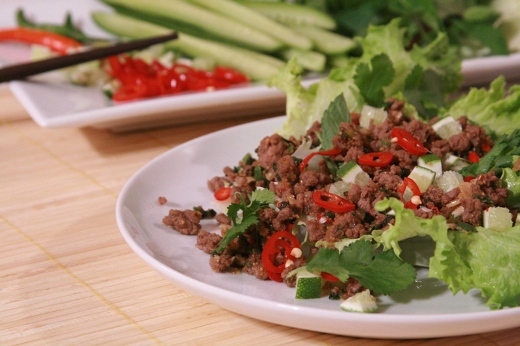 Probably the best-known Lao dish, laap is a chopped meat “salad” made of pork, chicken, beef, duck or fish, dressed with lime juice, garlic, crushed, roasted rice and herbs and served at room temperature. The meat used in laap can be raw or cooked. Popular raw laap variations include fish (the lime juice “cooking” it like a ceviche) and duck (with blood). Another flavor in laap is the rice grains that are roasted then crushed to a powde (kao kua). Not only does it add a fragrant nuttiness to the dish, it also serves to absorb some of the moisture. The casual observer might dismiss tam mak houng as being the papaya salad seen everywhere in Thailand, or the milder versions eaten in Cambodia or Vietnam. But the flavor of papaya salad in Laos is little different thanks to its fish sauce.The fish sauce is made from mud fish, and the resulting product is not the clear amber color travelers have come to know from Thai or Vietnamese cuisine, but a dark, thick, opaque, gritty (sometimes chunky) liquid whose strong flavor may be an acquired taste. Also, no palm sugar is added to Lao papaya salad. A meal of sticky rice, slow grilled chicken or pork with a side of tam mak houng makes for a delicious, filling meal and shouldn’t set you back more than $2-3USD. Originating from the Hmong of Luang Prabang, oh lam is a stew mainly made from vegetables: beans, eggplants, gourds, black mushrooms, then seasoned with lemongrass, chili, and coriander and finally thickened with sticky rice. Ho or Oh is loosely translated as “to put in”, which implies that this stew is a hodge podge of whatever ingredients are on hand. But the key ingredient is sa kan, a bitter root herb. Part of French Indochina for about 60 years, it’s not surprising to see vestiges of colonial France in Laos like faded yellow buildings, French signage, and of course, the food. The Lao have adopted the baguette, and khao jie pate (or Lao Sandwich), stuffed with pork pate, assorted greens and jeow bong (chili paste), is sold everywhere as a quick snack. You’ll also find some delicious French-Lao fusion food, French flavors and techniques combined with local ingredients and spices. An example is the “Trilogie de rouleaux de printemps” at La Signature in Vientiane – fresh springrolls but with distinctly French fillings like marinated feta (with bellpepper coulis), salmon tartar, and smoked duck dipped in pesto.